In today's volatile, often troubling economic landscape, there are myriad statistics and reports that paint an economic picture that can sometimes resemble a work by Jackson Pollock. These complex and often-conflicting reports could vex even the savviest investor. 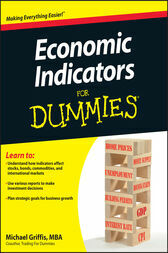 Economic Indicators For Dummies explains how to interpret and use key global economic indicators to make solid investments, aid in business planning, and help develop informed decisions. In plain English, it breaks down the complex language and statistics to help you make sense of this critical information. You'll discover how to interpret economic data within the context of other sometimes-conflicting reports and statistics, and use the information to make profitable decisions. You'll understand the meaning of such data as employment indices and housing and construction stats and how they affect stocks, bonds, commodities and international markets . . . and how you can use these statistics to make investment decisions as well as plan strategic goals for business growth. Economic Indicators For Dummies breaks down dozens of statistics and patterns to give you a better understanding of how various sources of data and information can be used. Whether you're an investor, economics student, or business professional involved in making key strategic decisions for your company, Economic Indicators For Dummies has you covered. Michael Griffis, MBA, has been an active trader for more than two decades. He has written about stock trading for online audiences, and today writes about investing and marketing for clients in the banking and brokerage industries.